GATETRIX V3 modular gate system for Tiny Whoop (optionally illuminated) by gerdfranz is licensed under the Creative Commons - Attribution - Non-Commercial - Share Alike license. I ordered a new package of those Fackelman Smoothie straws and realized that they have another diameter than the old ones ... althought the label states the same informations, even article number (see the uploaded pictures). Guess they wanted to save plastic/material due to cost. The old one were about 11mm in diameter and the new one are about 9,5mm. So, for this reason the original connector pieces don't fit perfectly so I've added those parts with a smaller diamter. Those parts have the suffix "_10mm". Also since many LED strips are 10mm wide you probably won't be able feed those thru this straws. The glow wire opinion will work in both cases and usually looks nicer. Due to the straw diameter, it is possible to router the glow wire 2 or even 3 times through the gate. In dark conditions absolutely not necessary, but in brighter conditions it might help to improve the visibility since the glow isn't as bright as LED strips. By winding the glow wire 2 time through the gate, the individual gate segments (straws) get kinda fixated. Therefore it might be possible that the "anti_slipper" pieces aren't necessary anymore. Haven't tested it, since I got TPU laying around but for those without the possibilty to print flexible materials, it might be a good option. Another idea for a modular, cheap, quick assemble/disassemble tiny whoop gate system. I used smoothie straws for this design. Those are from a company called Fakelmann and have about 10-11mm outer diameter and are 200mm long. The biggest benefit of this variant against GATETRIX V1 and V2 is the weight and amount of filament needed (not very much). So they are cheap, quick to print and can easily be attached to a doorframe, ceiling or where ever you like, since they are pretty light and can be attached using velcro or scotch tape. Downside to this system is, that the straws are not very strong. 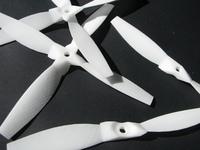 Strong enough for the whoop abuse, but not strong enough to create a good push fit meachnism for the printed parts, so that it doesn't fall apart when the gate get's hit. That's why the straws are connected additionally whith (soft) tpu printed straps (Anti_slipper.stl) which hold the straws inside the printed parts pretty well. The used tpu had a shore of 82A. After assembling 2 gates and after figuring out the best way to do it, I was able to assemble a complete gate in about a minute. or buy them in larger grocery stores (in germany at least). Illumination works with standard LED Strips and glow wire, which fits through the straws & connectors. I prefer the glow wire. Since they are usually not as bright as LED strips and therefore don't overexpose the FPV video feed from the whoop camera. Also those are very power economical and you can use 9V block battery to power those a whole day and don't have to fiddle around with power supplies or lipo batteries. These are the glow wires I used. You need a high hrequency converter for those to work. So if you glow wire doesn't come with one, remember to order one seperately. Say thanks by giving gerdfranz a tip and help them continue to share amazing Things with the Thingiverse community. Say thanks and help gerdfranz continue to share amazing Things with the Thingiverse community. You'll need a PayPal account to tip gerdfranz. Click the button below and you will be redirected to PayPal. Once the payment is complete, you'll be brought back to Thingiverse.